This is a 90-minute student-centered learning program specifically developed for grade 2 students. They will use objects and self-directed activities to discover the traditional Mi’kmaq way of life. The program launches with exploring what the students already know, then jumps into a roleplay Weir Fishing Activity, to a Moose Hunting Activity, and to a Circle & Cycle Activity. The program closes with a Circle Share Time as done in the Mi’kmaq tradition. Students will be challenged to think about how their own lives, activities, clothing and food are impacted by seasonal changes. 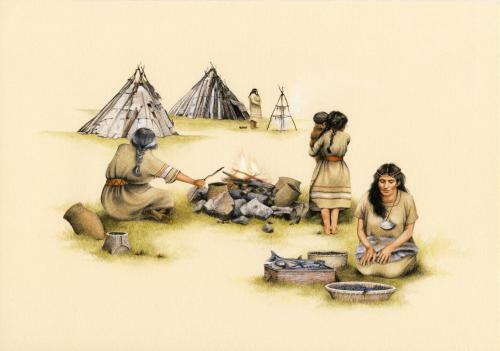 Through roleplay, they will explore some of the ways the Mi’kmaq understood the seasonal changes of living things. Using objects & images to collect data and make determinations, students will learn how the Mi’kmaq used their knowledge of the cycles of life in their hunting and fishing methods. The program closes with the Mi’kmaq custom of the Share Circle. The program begins in the First Fishers Exhibit with the entire group learning the layout of the program and the expectations of fair play and teamwork. The program starts with two activities that the entire class do together. Then the class will split into four groups and rotate to four different activity stations. Each group is assigned a group leader (teacher / chaperone) and they will receive a clipboard with all the necessary instructions of the four rotating activity stations. The programs wrap up with the Mi’kmaq custom of the Share Circle. The purpose of this activity is to the students thinking about what they already know about seasons and how they impact their lives. The purpose of this activity is to have the students learn through role play how the Mi’kmaq knew about the seasonal movements of fish, and how they used that knowledge to fish with different weirs. The purpose of this activity is to have students learn from images the seasonality of Mi’kmaq’s moose hunting. The structure of this activity is to a match an image to the statement. The purpose of this activity is to have students learn how all Mi’kmaq calendars are connected to the seasons of Mother Nature and to see the significance of the circle within their traditions. The activity is a match game format. The purpose of this activity is to have students learn from objects the seasonality of the items in a fast-paced game structure. Spin the arrow on the seasonal spin board and whatever season the arrow lands upon the student is to select an object that connects to that season in the Mi’kmaq’s traditions. The purpose of this matching activity is to have the students learn how the Mi’kmaq calendar is based upon seasonal changes in nature. The purpose of this activity is to share our personal experience of the program with one another & to learn about the Mi’kmaq tradition of a Share Circle.